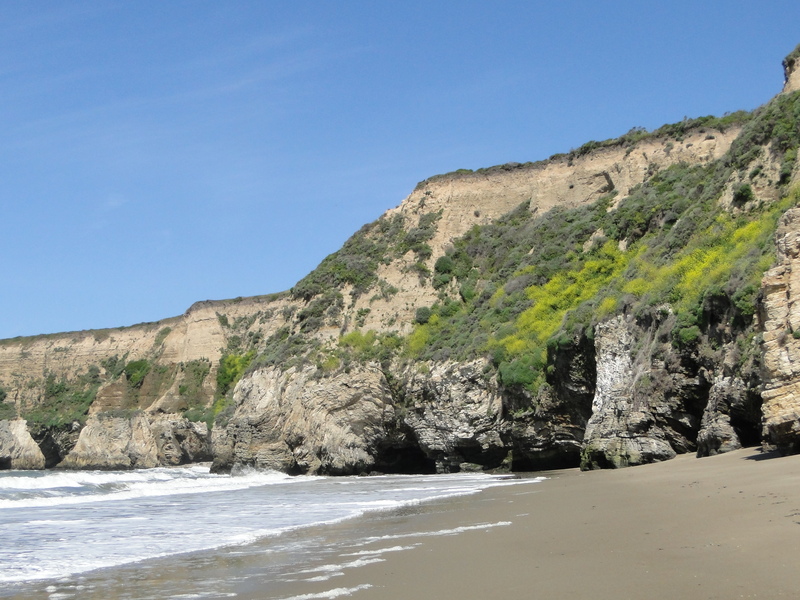 For the rest of the morning and early afternoon, after hiking from the camping site, I spent a well deserved relaxing time at Sculptured Beach which is just one of the beaches in Point Reyes National Seashore. With waves reaching the shores and birds chirping on the cliff’s walls as the only sounds, I fell asleep laying on the sand. Around four o’clock I left the beach heading north on the Coast Trail for about a half mile to where it intersects with Woodward Valley Trail. From that intersection I continued hiking east on Woodward Valley Trail for two miles, which is in fact the entire length of the trail that connects the Sky Trail to the Coast Trail. From there, hiking just over a mile and a half going south on Sky Trail, making a slight left turn onto Baldy Trail would take me to Glen Camp Loop. That’s to say that my hike back to the campground was estimated to be approximately seven miles; the total hike for the day would be close to 15 miles. More importantly, I would arrive at the campground about an hour before sunset. The weather was simply perfect. With temperature was in the mid seventies throughout the day, there was a pleasant breeze that carried scents of sea water, flowers, grass and the musky aroma of trees. However, something happened along the way that made me miss the sign to Baldy Trail! Instead, I continued on the Sky Trail veering west taking me back to the Coast Trail in the direction of Kelham Beach. That was a one and a half mile misstep that ultimately added a three miles round-trip to my day hike! It was only when the sound of the waves and the ever stronger smell of salty water were getting closer and closer that I began to realize I had missed Baldy Trail. Turning around aware that at least one hour and a half was just added to my ETA at Glen Camp, I sped up my pace to avoid hiking in the dark. I managed to reach the campsite at dusk but the fast paced hike wore me out. Glen Camp was not a popular site on that Monday, for I was the only person camping there on that day. Feeling tired and knowing that on the following morning I would be hiking five miles back to my car, I went to sleep early. My left eye was still itching with a growing burning sensation in the lower eyelid area. Nonetheless, I slept well and deeply waking up at five the following morning. 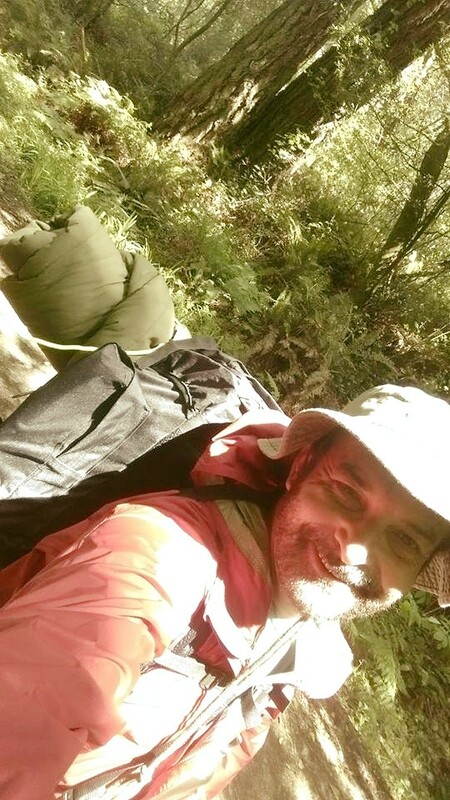 I dismounted the tent, packed and hit the trail. It was freezing! The temperature had dropped quite drastically in the past eight hours to only thirty-one degrees. The sun was still not hitting the trail under the trees and as I left Glen Camp . I wanted to arrive at the visitor center by or before nine o’clock. Therefore I kept a steady fast pace, stopping briefly only a couple of times to eat and rest. It was just about nine when I spotted my car. Having completed approximately twenty-eight miles of hiking at Point Reyes National Seashore in two days, I was ready to spend the day driving. My next destination was about seven to eight hours away, if I didn’t stop too many times. I was almost certain that I had to find a hotel for the night because it would be too late to look for a place for camping overnight. After three days without a shower it was time to enjoy the feeling of hot running water over my body. Perhaps I had come to that tipping point on the trip where I started to get great pleasures out of small, mundane things. Otherwise, such ordinary things were taken for granted in my until recent fast paced urban life. After all, a hot shower is only one more thing that we do in our daily routine. Stopping for lunch, cappuccinos, downloading pictures, recharging camera and cellphone, and pulling over at viewpoints along the way kept me on the road much longer than anticipated. My arrival time at the targeted destination was now around nine in the evening. I was going to visit the Crater Lake National Park and Klamath Falls, Oregon was a good place to spend the night and get an early start the next morning. The next morning I headed east of I-5 stopping Lassen Volcanic National Park. Depending on the weather conditions I would stay around or continue to Crater Lake. 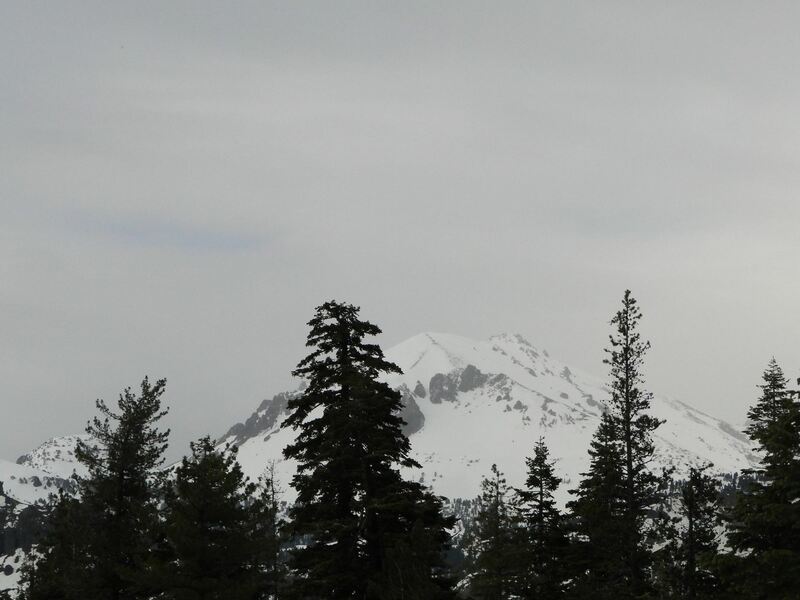 Although I decided for the latter, driving through the mountains toward Lassen Volcanic offered splendid views. As I returned to I-5 N, scenic Shasta Lake and the 14,180 feet Shasta Mount Volcano with the sun setting in the background through the cloudy skies of northern California made it for a long and pleasant drive. The wintry landscape along with temperatures in the mid forties and upper thirties were a far cry from the Spring warmer days and brighter skies I left behind just a day earlier. I arrived at the hotel in Klamath Falls after ten o’clock and it was cold. At check-in I learned that there is no waterfalls in Klamath Falls. I was told that at a time in its past history most likely there were waterfalls around. I was also told that the restaurants in town close at nine. There was, however, a pub located in the downtown area that still might serve food until midnight. After a much deserved and needed hot shower, I headed out in the hunt for hot food. At the pub I found out that the information given by the hotel front desk clerk was not quite accurate. The pub’s kitchen was basically closed, serving only a couple of “bar food” dishes. Although not my favorite, the fried macaroni and cheese tasted delicious and the extra calories were just what I needed at the moment. It was April 26 and after spending eleven days in California I had made it to Oregon. I was on the road for twenty-seven days and I had just entered a new phase of the road trip. From this point on I knew that the weather would play a substantial role in determining my route in the Pacific Northwest.